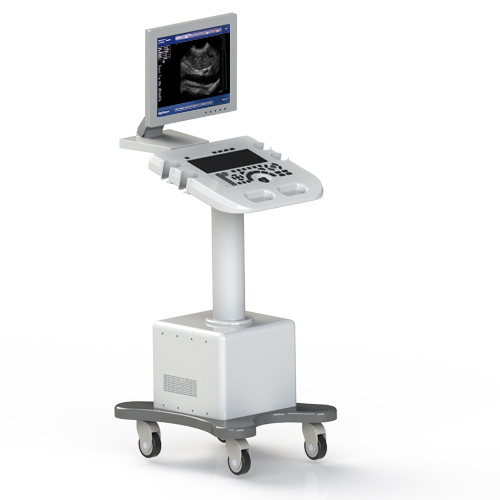 Easy mobility and steady appearence,Powerful function,with light,fast,practical characterisstics.It is suitible for examination of abdomen,gynecology,obstetrics,urology department and small organs,especially for the clinical examination of basic medical institutions and family planning system.Is a high cost-effective instrument. T75L40BN type linear probe: ×0.8, ×1.0, ×1.2, ×1.5. Application mode: abdomen, gynecology, obstetrics, superficial organ, urologist, heart and user defined model 1-4, total ten models. Receive: receive real-time dynamic focus by focus. Measuring function:B mode routine measurement:Distance, circumference, area, volume, angle, ratio, and stenos rate.M mode routine measurement: Heart rate, time, distance, speed, ratio, etc. Obstetrics measurement: EGA, ETD, fetal weight estimation, AFI index, OB report (including OB tables). Other measurement: Slice volume measurement, hip joint angle measurement..
Full-screen character annotation; Real-time clock display.